You must have healthy foods available in order to eat them. Bringing foods into your environment that have the lowest calorie “price tags” is a great starting point. By doing this, you are essentially making healthier food choices earlier than you might normally because you are being proactive in your environment instead of reactive. Do you have foods/snacks that don’t provide a lot of food for the calories? What is something you ate at home or work that gave you a lot of food for the calories? Identify a specific time(s) of day or situation when you more likely to eat higher calorie foods. Learning to anticipate your challenges and then reducing your caloric intake by the choices you make can help to reduce your calories for the whole day. Without structure, there’s’ almost no ceiling as to how high the calories can go. Stock your car and desk drawer with ‘hand fruit’ – apples, bananas, plums, grapes, etc. Peal and cup up fruit and put in ready to go containers. At work, bring the fruit and vegetables with you daily. I encourage you to strive to bring a minimum of 3-5 servings of fruits and vegetables to work daily. The more supportive foods you have on the counter at home, in the fridge, on your desk at work, in your car…essentially, anywhere you are, the more likely you’ll be able to prevent the higher calorie/higher fat foods from sneaking in your diet. Removing temptation/triggering foods and replacing them with some suggestions above, will have you feeling more in control of your environment and diet. How Carb Smart Are You? What do breads, cereals, fruits, juices, milk, yogurt, pasta, rice, potatoes, beans, vegetables, soda and desserts all have in common? If you didn’t already guess it from the title, it’s Carbs. When asked what foods contain carbohydrates, bread, pasta and potatoes are the most commonly identified. Many people do not realize that carbs are actually found in almost our entire food supply with the exception of meats, cheeses and fats. As Americans, we generally consume way too many carbs throughout the day. Most breakfast meals include toast, Poptarts, pancakes, biscuits or cereal followed by sandwiches, pizza, spaghetti and burger and fries for the rest of the day. These foods are also highly processed menu items that often contain preservatives and other added chemicals. This is a very controversial subject since these findings somewhat violate the laws of thermodynamics. Since there is no consensus on what low-carb actually is (for some studies it’s a mere 5% of total calories and for others it’s defined as 45% of total caloric intake), the term smart-carb has become more popular. Following a “smart-carb” diet in addition to exercise can help improve insulin sensitivity and assist in weight reduction in women with polycystic ovary syndrome. The obvious concern with consuming a low-carb diet is the increased fat intake and potential increased risk for heart disease. Fortunately, studies are confirming that higher fat intake when associated with a low-carb diet may not be as big of a problem as once thought. Low-carb meal plans may not always be the best, but choosing smart-carb lifestyles such as the Mediterranean and Paleo lifestyles are much more suitable for day to day living. Here are a few ways to smarten up your carb choices. Nix pretzels, crackers, chips and granola bars and opt for healthier carb and non-carb snack food choices such as fruits, vegetables, yogurt and nuts. Vary up your breakfast meal. Swap sugar-sweetened cereal and refined white bread for a veggie omelet, turkey sausage frittata or fruit with Greek yogurt. Serve vegetables with a side of vegetables. Many people state that they always have to have a starch with their dinner meals. Why not swap the rice and pasta for vegetable starches such as sweet potatoes, butternut squash or spaghetti squash? If choosing grains, consider whole grain choices such as oatmeal, quinoa or wild rice. Remember, limiting carbs is not the only way for improved health. The mere reduction of processed foods in one’s diet can have positive health effects. Lindeberg, S., Jönsson, T., Granfeldt, Y., et al. (2007). A Palaeolithic diet improves glucose tolerance more than a Mediterranean-like diet in individuals with ischaemic heart disease. Diabetologia,50(9):1795-1807. It’s that time of year again. Group fitness classes are packed, parking spots are limited and time limits on cardio equipment are more heavily enforced. It’s the New Year and everyone is hitting the gym. The New Year’s gym trend occurs all over. When I was teaching in college, students would line up outside the fitness studio at least 30 minutes before class began to ensure they would get a spot. Instructors loved having the large class participation and, quite honestly, it was a huge adrenaline rush. However, after spring break had come and gone, class sizes usually dropped down to less than 50% of the previous quarter’s numbers. Do NOT compare yourself to others. Even to this day, I still catch myself doing this from time to time at Crossfit. I’ll watch fellow crossfitters, whom I see as equal athletes to myself, deadlift more, row faster and perform more burpees than me. Something I tell my fitness participants in spinning class is “Don’t compare your Chapter 1 to someone else’s Chapter 20” and these words could not be any truer in my situation. Comparing oneself to others is one of the biggest fitness/health mistakes one can make as it often overshadows our own accomplishments and feats. When I started Crossfit 6 months ago, I needed a band in order to do a pull-up. Today, I can knock out 5 unassisted, strict pull-ups and I often overlook these strength gains I have made by too frequently comparing myself to others. When you’re in a class or working out on your own, don’t compete against the person exercising next to you. If you’re going to compete against someone, compete against yourself. See if you can push a little harder or match your previous workout’s accomplishments and remember the person working out today is much healthier than the person who was sitting on the couch yesterday. It’s okay NOT to do what everyone else is doing in class. In any fitness class, you are going to have a wide variety of people with different fitness and experience levels. A great fitness instructor will demonstrate several modifications for an exercise so that everyone can equally participate in class. Stick with the variation that comfortably challenges you. Typically there are at least three levels of modifications for most exercises, and your instructor should show all varieties and perform the middle modification for the majority of the class. If you feel that there were not enough modifications given, talk to your instructor during one of the drink breaks or after class. Their job is not to “get paid to work out” rather they should be providing guidance, knowledge and motivation to group fitness participants. Bring water. Water is essential when someone is exercising. A good rule of thumb is to take a drink of water every 10-15 minutes (or even more often when exercising intensely) when working out. Remember to continue to drink water after your workouts since a large amount of fluid is lost through perspiration. I took my first spinning class over 7 years ago. I specifically remember thinking, “This can’t be that hard, I ride my bike outside all the time. Why would I need a water bottle?” Four minutes into class, I was seen racing to the vending machines to purchase a water bottle. Wipe down equipment before and after you use it. You are never guaranteed that the person before you wiped down the piece of equipment after they had used it. 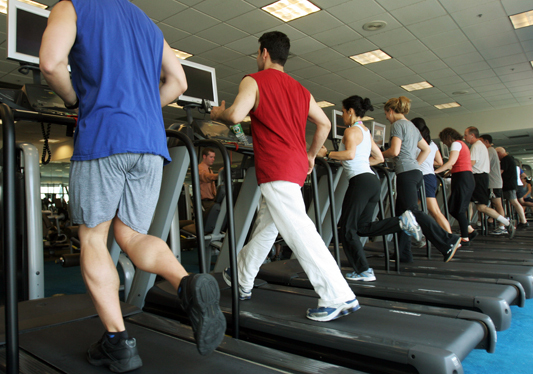 This is why I always wipe down my weight or cardio machine before I begin my exercise. With cold and flu season in full swing, the gym is a breeding ground for sickness with so many people together in an enclosed setting.